Idle Queen dockside. This project is just beginning. I frequently question my decision to move to the larger Idle Queen from my last boat, Sirocco. After all, I am still very much enamored of Sirocco, and I have long been a proponent of smaller boats. Not many people would consider Sirocco a complicated boat in her present configuration. She has pressure fresh water and refrigeration, sure, but her windlass is manual and her compliment of electronics is adequate but simple. Even so, she is more complicated than my “new” boat, Idle Queen, which has only a bare minimum of modern fittings aboard. Idle Queen is missing many of the standard items found on modern sailboats, like roller furling, a winch for each jib sheet, and more. She has only two seacocks below the waterline. She is lightly powered, with her engine providing just over 1 horsepower for each ton of displacement. The cabin sole is painted plywood instead of teak and holly. Much of her paint comes from the hardware store. These details aren’t very “yachty”, but they help offset the added expense of having a physically larger boat when it comes to maintaining and operating her. I explained why I am moving to a larger boat in a previous post (see here). The additional room aboard the larger boat will allow me to carry everything I need for more expended trips away from yachting centers. Wonderful. 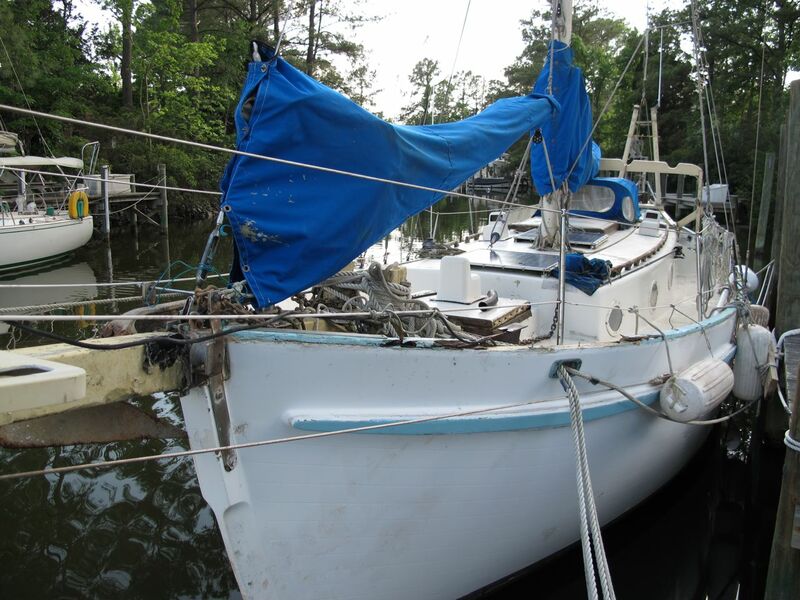 The big challenge, though, is that my budget for maintaining this boat is no larger than what I had before. If anything, it is smaller because of the money that I spent this winter having a car in this area. Cars will keep you poor. I plan to make up the difference by not complicating Idle Queen one bit more than necessary. So, specifically, how am I planning on closing the budget gap? For starters, I am going to live with the unique interior of Idle Queen as she is for a while. Harry Heckel Jr., the original owner, built a custom arrangement down below that is far from the traditional small sailboat layout. One of the first things that I wanted to do with Idle Queen was to change the layout to one with parallel settees in the main saloon instead of the dinette that is currently onboard. I can eliminate a huge expense and time-sink by just keeping the arrangement the same for now. I’ll be losing some storage space, but the current arrangement has worked for two circumnavigations so far. The tanks on Idle Queen almost all need replacing. The two exceptions are a little 10-gallon fuel tank, and one polyethylene water tank. The current plan is to make up the difference with portable tankage. For water, I will carry as many 3-4 liter water bottles as I need. I have been doing this for quite some time now, beginning when I discovered that the fiberglass water tank on my Contessa 26 was unusable for potable water. I bought 20 gallons of drinking water in bottles at a cost of about $20, and have had 20 gallons of cleanable, portable, re-usable water tankage ever since. I used the same bottles on Sirocco to supplement the tankage onboard, and I see no reason to abandon the system now. I can empty the bottles into the small gravity tank that supplies the galley faucet to produce running water. On the diesel tankage side, the little diesel engine on Idle Queen will run for about 30-40 hours on the currently usable 10-gallon tank. I plan to build secure below-decks storage for an additional 20 gallons of diesel tankage in the form of 5-gallon jerry cans. If I need more tankage, I can always expand the storage scheme. For lighting, I know that there are many sailors who, in the name of simplicity, have stayed with kerosene lanterns. Some have even kept their boats free of any installed electrical system. My current plan is not quite as low-tech. LED lighting has finally come down enough in cost for me to decide to use LED lights for the main cabin lighting solution aboard Idle Queen. There will be a minimum of wiring involved, and it will all be accessible. I will keep the current fluorescent fixtures until they cease to function before spending money on new fixtures, and I will probably end up assembling my own lighting fixtures rather than spending on the ridiculously overpriced marine lights currently available. A few years ago, I compared the cost of changing Sirocco over to all LED lighting versus just buying enough solar panels to run the incandescent lights that she already had. It was much cheaper to just buy more solar generating capacity. Now the cost of LEDs have come down enough to make them an attractive option. I already have 50 watts of solar panels on Idle Queen. My goal is to keep my daily consumption under what they can supply. I will keep a couple of kerosene lanterns around just in case lightning takes out the electrical system… Backup systems are important. There are a few other items that I will be going without that make it onto the “must have” list for many cruisers: items like refrigeration; roller furling; a bimini; an autopilot (IQ does have a windvane); and so forth. If I can pick those items up for little money along the way (or better yet–free! ), then it’s not like I am opposed to having them. I just need to keep reminding myself that the most important things to take care of on the boat are keeping the hull sound and the running gear strong and functional. Almost everything else is just budget-eating, boat-cluttering stuff that can probably be lived without. If you want to super budget your led lighting and happen to be handy with a soldering iron then here’s a simple idea. Harbor Freight sells these small portable flashlights that have 27 LEDs in them and run off three triple A batteries.